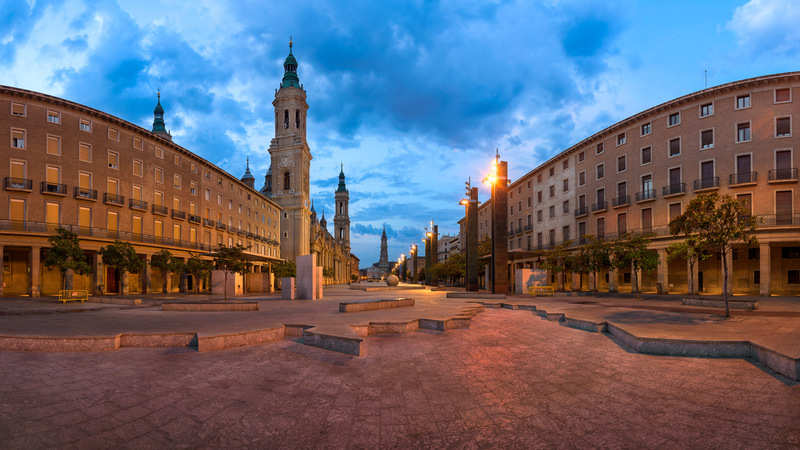 I awoke early one morning to photograph the Plaza del Pilar and Basilica of Our Lady of the Pilar. June 2016, panorama from 4 vertical images, additional exposures for highlights, focal length 16mm, aperture f/8, shutter speed 1.3 seconds, ISO 64, tripod. Setting up my tripod in modern-day Zaragoza, it was difficult, at first, to appreciate the basilica’s ancient origins and its importance to early Christianity. But in the quiet and cold of an early morning, with few people around, the site’s significance was easily apparent. I’d visited the basilica before and was familiar with its story tied to St. James the Apostle and his quest to bring Christianity to Spain. The Basilica of Our Lady of the Pilar isn’t only revered because of its ancient ties to Christianity. The faithful believe that miracles have occurred here. Perhaps the most famous of these involved a beggar named Miguel Juan Pellicer in the seventeenth century. Pellicer was unable to work because of an amputated leg, and often went to the basilica to pray. Because of his faithfulness, the Virgin restored Pellicer’s leg, making the basilica a pilgrimage site for the faithful. Over the centuries, the basilica and the surrounding plaza have become integral parts of Zaragosa. Each year, religious people from around the world come here for the Offering of Flowers, a ceremony in which they offer flowers to the Virgin del Pilar. More recently, in the twentieth century, the site was significant to the founding of the Opus Dei movement. This morning, however, the ceremonies and the religious pilgrims don’t seem to matter. In the quiet, I can picture the faithful beggar Pellicer coming to make his supplications. With the breeze coming in from the Ebro and with early morning light just breaking through the clouds, I frame the shot with the Basilica at its center. It is lovely, serene, and easy to see why so many are drawn to the site. This entry was posted in City and tagged Spain, Zaragoza.